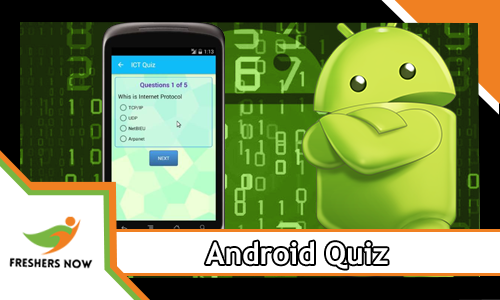 This Android Quiz is comprised of various questions from different levels. So facing that Android Multiple Choice Questions will help to know the language from the primary level. And to be active in any programming language, basic concepts are mandatory. Moreover, to cope up with the computational world, proper knowledge of Android is compulsory. From this web page, aspirants can know about the Android Programming, Benefits of Android Online Test and Results. As a part of this candidates need to face the Android Online Test. So we advise the individuals to take this Android MCQ and learn the Android language. This Android Quiz will also help the candidates who are facing the interviews. The total number of Questions in the Android Quiz is 25. Each correct answer is awarded one mark. Also, there is no negative marking. And, click on the ‘Submit Test’ button mentioned at the bottom of this post to get your answers submitted. Do not refresh the Page and wait until results are displayed. 3. Which file specifies the minimum required Android SDK version your application supports? 4. As an Android programmer, what version of Android should you use as your minimum development target? 5. Parent class of Activity? 6. Although most people’s first thought when they think of Android is Google, Android is not actually owned by Google. Who owns the Android platform? 7. What are the Direct subclasses of Activity? 8. What was Google’s main business motivation for supporting Android? 9. What was the first phone released that ran the Android OS? 10. What is the use of content provider in android? 11. Which of the important device characteristics that you should consider as you design and develop your application? 12. What part of the Android platform is open source? 13. Which of the following is NOT a valid usage for Intents? 14. When did Google purchase Android? 15. Which of the following is not a valid Android resource filename? 16. Parent class of Activity? 17. Which Android version had the greatest share of the market as of January 2011? 19. The Emulator is identical to running a real phone EXCEPT when emulating/simulating what? 20. Android is based on which language. 22. Which piece of code used in Android is not open source? 23. Select a component which is NOT part of Android architecture. 24. Which company bought android? Android is Mobile Operating System developed by Google. Moreover, the world is in the path of Mobile Technology. So, one of the widely used Technology in Mobile is Andriod. Android is the software bunch consisting of not only the operating system but also included with middleware and critical applications. Android is the powerful Operating System supporting a large number of applications in Smart Phones. These applications make life more flexible and advanced for the users. This Android Quiz is useful for the candidates who are facing the interviews. And also it helps in knowing the concepts from basic. Moreover, this will be like an Online Mock Test. Also, this Android MCQ Online Test will help to learn the coding from initial. As soon as the candidates submit the test, results are displayed. And we mention the results after submitting. Additionally, we also provide the Android Questions and Answers so that candidates do not repeat the mistakes in future. We request the aspirants look at the results so that you can rectify the mistakes. We hope the mentioned information about Android Quiz is informative and useful. So aspirants keep visiting our web portal Freshers Now on a regular basis. And we will frequently update our page with more relevant information about Android.